New private investigator on the scene in Los Angeles is Laura Holt. 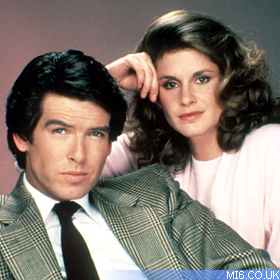 Struggling to get work, Holt invents a suave, confident, experienced and male PI, whom she calls Remington Steele. One day a mystery man walks into her life and adopts the persona of Steele and she reluctantly allows him to become her 'boss'. James Read, Janet DeMay, Cassandra Harris, Michael Constantine, Sharon Stone, Blake Clark, Jack Scalia, Paul Reiser, Guy Boyd, Ray Girardin, Pedro Armendáriz Jr., Alan Blumenfeld, Peter Jason, Julian Glover. Los Angeles, CA; Las Vegas, NV; Mexico; Ireland; Malta; Cannes, France. The titles of the episodes throughout all five seasons are a pun based on the name "Steele". Some of the better titles include: "Thou Shalt Not Steele", "Steeling the Show", "Steele Crazy After All These Years", "Steele Eligible" or "Steele in the Family". Right: Zimbalist and Brosnan as the dective duo. Remington Steele is a fictitious private investigator, invented by the show's protagonist, Laura Holt in order to lend 'credibility' and a male authority figure to her fledgling investigative business. A handsome stranger in the guise of Pierce Brosnan walks into her life and adopts the persona of 'Remington Steele' during the course of the pilot. 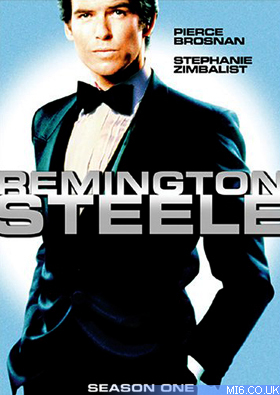 The name Remington Steele is said to have been taken from Holt's Remington typewriter and the Pittsburgh Steelers. 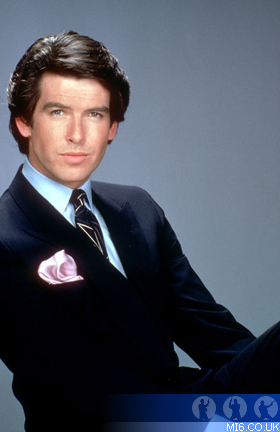 Remington Steele is the show that made up-and-coming Irish actor Pierce Brosnan a famous face in American prime-time. The character is of the caper and private-eye world that could be labeled a derivative of the genre James Bond made popular. During the filming of "For Your Eyes Only", Bond producer Broccoli had lunched with one of the film's co-stars, Cassandra Harris who had introduced the producer to her fiance, a handsome young Irish actor by the name of Pierce Brosnan. Broccoli had been impressed by Brosnan and, when Roger Moore hung up his tuxedo after "A View To a Kill", had sought him out with a view to casting him as Bond. At first it looked as though Remington Steele was being cancelled by NBC and that Brosnan would be free to accept Broccoli's offer to join the EON team. But as the world's press leaked more information about the new Bond, NBC changed its mind and asked producers Mary Tyler Moore Television for another series of Remington Steele and Brosnan, still under contract, had no choice but to turn down the chance to play 007. He would get a second chance in 1994. 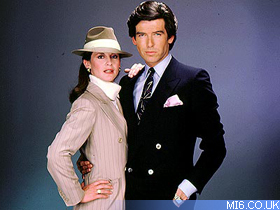 Created and predominately written by the collaboration of Robert Butler (famed for 'Hill Street Blues') and Michael Gleason (producer and scribe of 'McCloud' and later 'Diagnosis Murder'), Remington Steele debuted in the autumn of 1982 on NBC Friday primetime. The memorable theme music was created by American composer Henry Mancini, who had contributed to the sounds of "The Pink Panther" and "Breakfast at Tiffany's". Originally, it was pitched without the presence of the title character. The gimmick being that he never existed - as Laura Holt would have had it, if she had had her way. But at the pitch, although it largely met with network executives' approval, there was one major change that had an overwhelming effect on the way the series panned out. NBC, who were on the verge of commissioning the show, insisted that the producers introduce a male lead character and in this way, Pierce Brosnan hit the screens as the soon-to-be famed PI. The creators made a brave decision casting two unknowns - one of them recently in town from extensive work in the UK and Ireland, but a fresh face in Hollywood. Pierce Brosnan, who would go on to become the fifth James Bond actor, was ushered into American homes and became an overnight sensation, along with the show. Within the course of the first season's airing, Brosnan was headlining People Magazine on 31st October 1983. The first season would also introduce regular co-stars James Read and Janet DeMay, both of whose careers were kick-started by the success of Steele. Read played Murphy Michaels, the long-suffering PI who was always overshadowed by the debonair Steele whilst DeMay would serve as Bernice Foxe - whom Steele would always miss-name Miss. Wolf - the Remington Steele Agency's secretary. By season two a few things hand changed. The production was given a larger budget by its backers and a new Tuesday night slot. Despite the bigger budget, the two semi-regulars in the form of Murphy and Bernice were dropped from the recurring stories and the role of Mildred Krebs (played by Doris Roberts) was crafted. She would be an able bodied assistant to Holt as well as a motherly figure. Season three stretched the budget even further, with filming in Europe and the UK whilst the home of Steele was Los Angeles and host to the 1984 Summer Olympics. The fourth season continued the formula throughout the winter of '85-'86 with the regular cast returning to LA where they had left off. By May 1986, the show was cancelled after NBC felt the production was going nowhere. However, Pierce Brosnan was still under contract when he auditioned for and was offered the role of James Bond. The media frenzy around the Irish star was so great that NBC opted to lock the Irish actor in for the fifth and final season of "Steele". 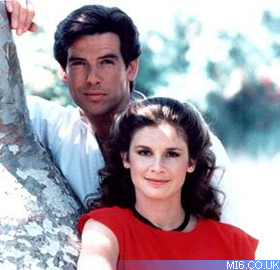 Season five of "Remington Steele" aired throughout the spring of 1987, with the first of three two-part stories filmed on location in Mexico. This shorter season consisted of six extended episodes, each serving as one of a two part story. Pierce brosnan was free of his contract by 1987 and moved on to a busy career before 007 came calling again in 1994.